The sentiment about stocks of retailers received a boost after India last week decided to allow 100% foreign direct investment (FDI) in single-brand retail—from a limit of 51%—and allow 51% FDI in multi-brand retail, although with some riders. The doors are now open for global multi-brand retail firms such as Wal-Mart Stores Inc., Carrefour SA and Tesco Plc and new global brands such as GAP, IKEA. Punters have lost no time in pushing up the stocks of retailers. The Pantaloon Retail (India) Ltd stock rose sharply by 31% to ₹ 234 in the last two trading sessions on the news. Pantaloon is likely to benefit the most from this move. For one, it will help the firm reduce debt, which has been a key worry for investors. The company’s debt to equity ratio at the end of the current fiscal is estimated by analysts to be around 2.5. So, naturally, if a foreign retailer infuses capital in Pantaloon and the company uses that money to reduce debt, it will help its balance sheet. Profitability will also improve in the form of lower interest burden. The company’s growth plans can be funded by the fresh equity infusion. Also, it is present in multiple formats and has a large existing footprint of 15.5-16 million sq.ft. At Friday’s market capitalization, a 20% stake sale would bring it around ₹ 970 crore. Trent Ltd, which owns Star Bazaar, a hypermarket chain, too, is expected to benefit from this development as it already has a tie-up with Tesco. It may look at improving its relationship further. On the other hand, Shoppers Stop Ltd, which has a 51% stake in Hypercity stores, may consider a strategic tie-up for Hypercity in the long-run. The companies indirectly exposed to retailing could also benefit. CESC’s retail subsidiary Spencer’s could gain as investors would expect earnings from CESC’s power business to be ploughed back to fund its large pipeline of projects instead of funding the retail operations’ losses, a point made by analysts of Edelweiss Securities Ltd. Similarly, Apollo Hospitals Enterprise Ltd, which operates Apollo Retail Pharmacies, a large chain of pharmacies, could benefit by a foreign equity partner. Spinning off the low-profitability retail business and infusing fresh equity through FDI will unlock value. Edelweiss analysts also say that “an influx of new entrants in the sector will broaden the addressable market size for mall owners and impart enhanced bargaining power, which will reflect in higher rentals and capital values". Phoenix Mills would be a beneficiary of this trend. 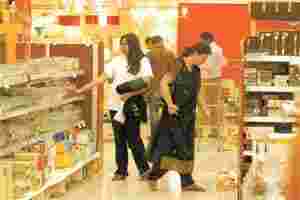 Others who could gain include Aditya Birla Retail, which operates the More shops, Reliance which operates Reliance Fresh, and Bharti Walmart Pvt. Ltd, a venture of Bharti Enterprises and Wal-Mart Stores. While the stocks of Pantaloon, Shoppers Stop and Trent increased 31%, 12% and 10%, respectively, in the last two trading sessions, in the last three months the same stocks have declined 14%, 0.5%, 4.5%, respectively. The benchmark Sensex on BSE Ltd has declined by 3.6% in the past three months. In general, FDI in retail is expected to benefit the Indian retail sector in the long run through better operating efficiencies and lower prices for consumers. Competition will increase. Analysts expect the value retailing segment, including the value-for-money goods, to be affected more from these developments compared with the lifestyle retailing (upscale goods such as apparel and accessory). A lot depends on how quickly things unfold. In the short-run however, concerns on same-store-sales (SSS) growth remain. In the last quarter, Pantaloon’s SSS growth for value and lifestyle retail was the lowest in the last 13 quarters, according to a result update note from Prabhudas Lilladher Pvt. Ltd earlier this month. True, Pantaloon’s stock has run up the most in the lot after the FDI announcement, but if there is no meaningful development on this front in the near term, and if the company announces disappointing financial performance in the meanwhile, this dream run could be short-lived. While opening up the sector to overseas investment will improve the health of existing firms, investors could wait for a pullback to enter these stocks.